Inspectors have surveyed almost two thousand miles of roads across the region to identify the damage. Cumbria has received almost £2.9 million from the Government to repair potholes across the county after damage caused by recent storms. A driver has sent a tongue-in-cheek invoice for £365 to Scottish Borders Council for pothole damage to her car. Michaelle Burns-Greig says the state of the roads is a disgrace and wants to see vast improvement. The local authority has upped it's spending on road for this financial year to £3.7million. The roads are actually getting worse despite all the pot hole covering and everything that's being done. The road situation is getting worse and yet a lot of money is being spent on it, which is being wasted and we are papering over the cracks at best." Barry Taylor from Lockerbie sent in this photo of road B723 in Dumfries and Galloway this week. The Director of the RAC Foundation is warning people across the south of Scotland and Cumbria that there is a major roads maintenance backlog. Steve Goodring says that individual councils are doing what they can with limited budgets, but that people shouldn't have to deal with damaged cars due to potholes. It's been announced that Dumfries and Galloway Council has received the fifth-highest number of pothole compensation claims of all Scottish councils in the last year. Almost 300 claims were made, but only 28 of these were successful. In total, the council paid out more than £6,000 to claimants. Dumfries and Galloway council has received the fifth highest number of pothole compensation claims of all Scottish councils in the last year. claims were made to Dumfries and Galloway council, but only 28 of these were successful. In total, the council paid out more than £6,000 to people who claimed. The Government has announced that Cumbria is set to benefit from almost £1.5 million to help with pothole repairs. The county has been hit particularly hard following the widespread flooding in December. Councils across the north west have been allocated £6.4 million, with Cumbria receiving the largest share. The money will be used to fix the estimated 27,000 potholes across the county. 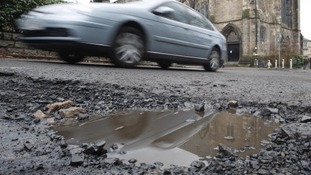 Cumbrian motorists come out on top when filing pothole damage claims, according to new RAC Foundation figures. The number of successful pothole damage claims by motorists in the Border region varies by more than 20%. 26% of claims in Cumbria and 20% in Dumfries and Galloway succeed compared to just 4% in the Scottish Borders. The council is encouraging Cumbrians to download a free ‘Fill That Hole" app to report potholes. The app allows users to take a picture of the pothole and report it from the kerbside. The app then sends that data to Cumbria County Council’s highways teams. “Whilst our highways hotline is a successful way of reporting potholes, we know that many people use their smartphones more and more these days and we are embracing this culture shift by endorsing ‘Fill That Hole’. Paul Crone meets the owner of a business that is suffering due to potholes. A local business has has taken it upon itself to fill in a pothole despite having no obligation to do so. It follows a dispute over who is responsible for the maintenance of the road. The Warwick Bridge Business Centre filled in the pothole that lies outside 'Sally's tearoom' in Warwick Bridge, despite the land having nothing to do with them. It is currently unclear who is responsible for maintaining the road, with Cumbria County Council claiming it has no role to play in the roads upkeep. “Unadopted road and private roads are the responsibility of the householders or landowners to maintain.